The Keyper is a solid keyring from maxpedition that can be used as a keyring or as an attachment point for several items in backpacks, bags and other items. The keyper has double loop (3 straps) of cordura nylon with reinforced stitches that closes using strong velcro. The three straps allow your belt or attachment strap to remain isolated from the velcro and then the velcro closure has contact in 100% of its surface for a stronger result. Attached to the loop is a metallic spring clip, the clip has an "eye" that can be used to pass a splitring or some paracord if needed. The belt/backpach attachment loop is extremely strong and resistant regardless of the weight the keyper will not dettach or fall. The metal clip is quite good but the spring might lose some tension with constant use but not enough to make splitrings fall. Retailing for about $9 the keyper is a very solid keyring and attachment accesory for your backpacks. You can read more in Maxpedition website. 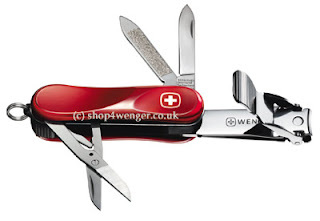 For many people a nail clipper is a lot better to trim nails than a pair of scissors, specially if your weak hand is a lot weaker than your strong hand; this multi-tool from Wenger features both: nail clippers and scissors along other tools in a very small package certainly suitable for keychains. The tool is 65mm (2.5 in) long and 18mm both in width and depth (0.7 in), the total weight is 40gr (11 oz). The Evo Nail Clip has a small blade letter-opener style, a toothpick, nail cleaner with file, scissors with micro teeth and the lever operated clippers. The clippers work flawlessly they are easy to deploy, easy to use and cut perfectly. The scissors with micro serrated edges are very good and will cut more than what the size suggests. The nail file, blade and toothpick are good complements. The shape of the tool is attractive offering a good grip and it comes with a split ring for keychain. Certainly an interesting tool if you prefer nail clippers to scissors for your nails. You can read more and order for about $20 following this link.